Today I announced my candidacy in the 2018 Republican Primary for U.S. Senate against the incumbent Deb Fischer because she is doing nothing to reduce our national debt which is badly out-of-control. My announcement speech was completely focused on the magnitude of our debt problem and what I think can and should be done about it. The debt issue is why I am in the race, what clearly distinguishes me from Fischer, and where I think she is vulnerable. Of course there are other important issues and I am willing to discuss them when asked. But to bring up other issues on my own diminishes the fundamental importance of the debt issue. Conclusion. I am an unconventional candidate. I am running more against the debt than I am running against Deb Fischer. I have nothing against her. I merely want to get our debt problem fixed before it does great damage to our country and she is standing in the way. Yesterday was Martin Luther King Day and every year at this time we are reminded of his eloquent letter from the Birmingham Jail, “Why we cannot wait,” written to some of his hesitant supporters in the Spring of 1963. African-Americans were tired of waiting so long for equal rights in their own country. 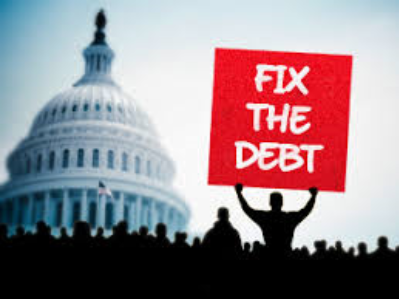 On my own personal scale, I am so frustrated by the inability of our political system to address our massive debt problem, that I am getting organized to enter the 2018 Nebraska Republican Senate Primary against the incumbent Deb Fischer who has just voted (with the new tax law) to increase our debt by $1 trillion over the next decade. Basically I am saying that our debt is so large and growing so fast that it will soon be out of control if we don’t take action to start reducing it very soon. 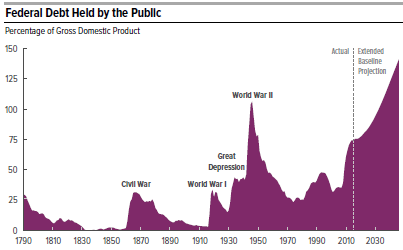 The public debt (on which we pay interest) is now 77% of GDP, the highest since WWII, and projected by the Congressional Budget Office to keep getting steadily worse. It will grow by $11.5 trillion in just 10 years to almost 100% of GDP and will reach 150% of GDP, double the current level, by 2047, without major changes in current policy. 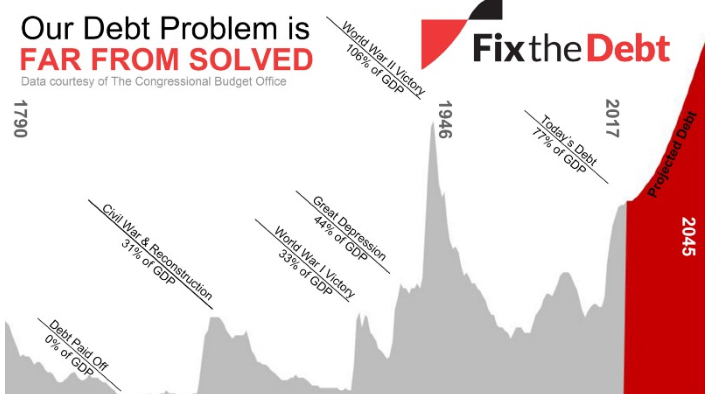 A fiscal crisis, much worse than the Financial Crisis of 2008, will occur long before 2047 if nothing is done to greatly shrink our annual deficits which are again rapidly approaching the trillion dollar per year level. The new tax law increases deficits by an average of $100 billion per year, and therefore makes it that much harder to shrink them down substantially. It is imperative for the two parties, Democrats and Republicans, to work together to figure out how to do this. Conclusion. 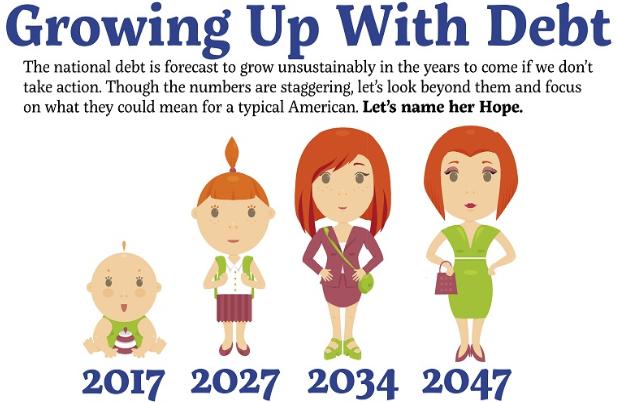 Our national debt is so large and growing so fast that it is virtually out of control. We need prompt and fairly strong action to turn the situation around. I have often discussed one major way to do this. I think he is too flawed, self-centered and sociopathic to accomplish much. I believe that tax reform will become tax cuts for the wealthy (no inheritance tax, etc.) 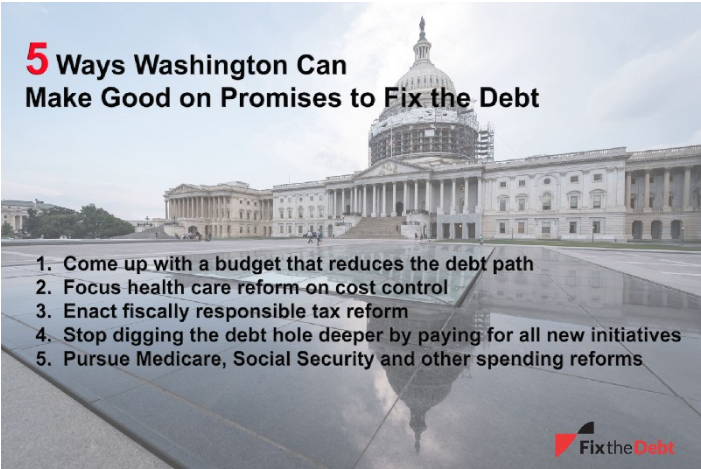 and dealing with budget deficits will not happen. I know you think Trump will be contained by the conservative members of Congress. The Republicans seem unwilling to confront him or speak out as long as his base continues to be very loyal. I think he is so wounded now that it will be hard to accomplish much. Coming up with a budget that reduces the debt path. No one expects the budget to be balanced in one year. Last year’s Republican plan would have taken ten years to get the job done. The important thing is to clearly move in this direction. Focusing healthcare reform on cost control. Give the Democrats credit for expanding healthcare access with the Affordable Care Act. But now focus on reining in the cost of healthcare in America. Enacting fiscally responsible tax reform. Most people agree that the tax code is a complicated mess and, especially, that the corporate tax rate is too high. There are many ways to achieve lower tax rates and simplification in a revenue neutral way. 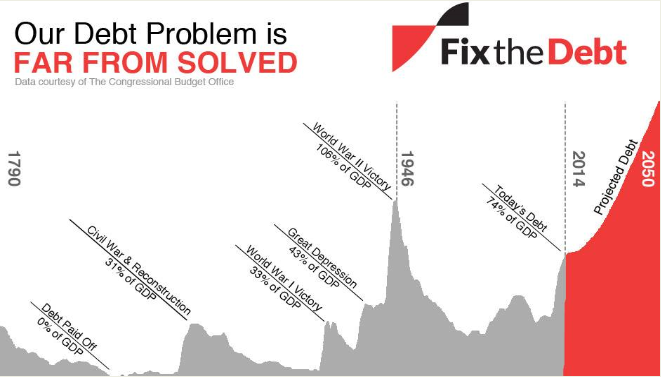 Stop digging the debt hole deeper by just adding new initiatives. There will always be attractive new programs which are worth pursuing. But in adding them to the federal budget, other programs which are no longer effective need to be phased out. Reforming entitlements such as Social Security, Medicare and Medicaid. These are the big drivers of national debt. Without entitlement reform, all other efforts to restrain federal spending will be insufficient. Conclusion. There is nothing easy about pursuing the above agenda. Implementing it will be highly controversial with lots of vociferous opposition. 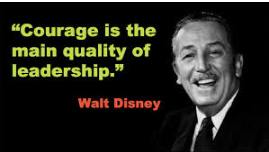 It will take strong leadership to push it through. But it represents a huge opportunity for a controversial president to do something worthwhile. My last three posts have discussed the long term damage that will be caused by excessive spending in the recently passed 2016 federal budget and what should be done about it. In the 1995-96 session of Congress, the House of Representatives passed (by a 2/3 vote) a BBA but it was defeated in the Senate by one vote. Application by 34 states requires Congress to call a Constitutional Convention to propose an amendment. At the end of 2009, 16 states had so applied. Each year since one or more new states have also applied and now there are a total of 27. An additional 13 states are actively considering applications for a BBA at the present time. As the number of applying states gets close to the required 34, it becomes more and more likely that Congress will act on its own in order to preempt a “Con-Con.” This would avoid the messiness and uncertainties of such a convention, none of which have yet occurred in our nation’s history. Once 34 states have applied, however, Congress must call a convention. Any fear of a runaway convention, exceeding a limited mission, should be alleviated by the fact that any proposed amendment(s) have to be ratified by 38 states. In my opinion a proposed amendment should have no restrictions on how a balanced budget will be obtained. There will be far more political pressure to cut spending than to raise taxes. Let Congress hash out the proportion of each. Fiscal responsibility does not require the budget to be exactly balanced each year. In fact, temporary deficits can be useful as a stimulus in time of recession. However, deficit spending has gotten so far out of control in recent years that Congress must be forced to modify its behavior. Myth: Social Security does not face a large funding shortfall. Fact: Social Security’s trust funds are projected to run out of reserves within 20 years. Although the Social Security Trust Fund currently contains $2 trillion, it is being depleted at a rate of close to $100 billion per year. 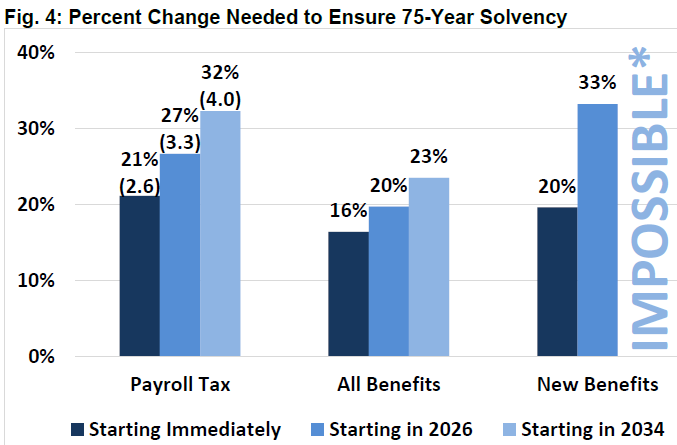 The looming insolvency is a result of the growing costs associated with an aging population. Myth: Today’s workers will not receive Social Security benefits. Fact: Even if policy makers do nothing, the program will still pay about three-quarters of scheduled benefits. Once the trust fund is depleted, benefits would be paid only from incoming payroll tax revenue. Myth: We don’t need to worry about Social Security for 20 years. Fact: there is a very high cost involved in waiting to reform Social Security. Substantial changes are needed to avoid the benefit cuts referred to above. The sooner we make these changes the less onerous they will be for both recipients and payroll tax payers (see above chart). Myth: Social Security reform is code for slashing benefits, especially for the poor. Fact: under most reform plans, benefits would continue to grow faster than inflation. Most reform plans do not cut benefits from their current levels but rather slow the growth of benefits to reduce some of the pressure that wage-growth and rising life-expectancy place on the program. 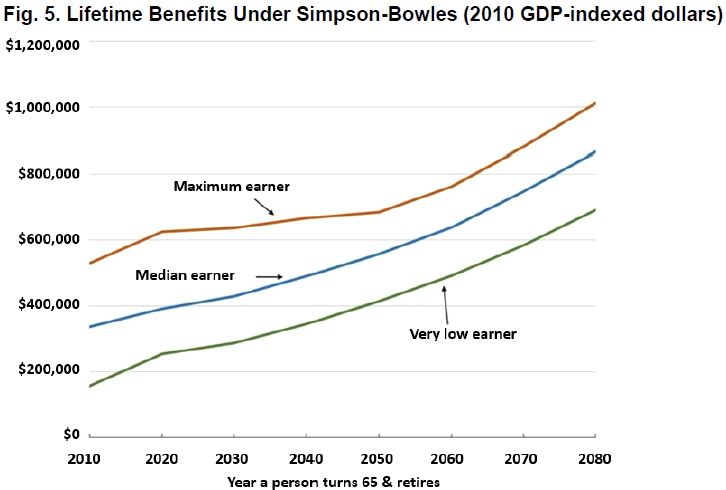 Under the Simpson-Bowles Plan, for example, benefits for low-wage earners will grow much faster, proportionally, than for higher-wage earners (see above chart). Conclusion: It should be clear from the above discussion that Social Security can be fixed so as to continue to provide retirement benefits indefinitely into the future. It should also be clear that the sooner the needed reforms are implemented the less painful they will be for all concerned. We should tell our Congressional representatives that we want them to act now!